Landholders around Swanpool have been doing their bit to reduce the numbers of the Indian or Common Myna in recent months, by joining the Benalla Indian Myna Action Group. Traps, specially designed and built to catch the Mynas, are baited with Myna-food and left outside, where Mynas hang-out. 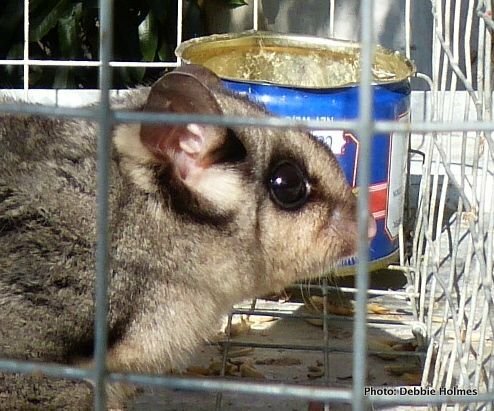 Apparently, very few native birds get caught in these traps, but who would have thought the trap would catch one of the rarer marsupials in the district – the Squirrel Glider (Petaurus norfolkensis)!! 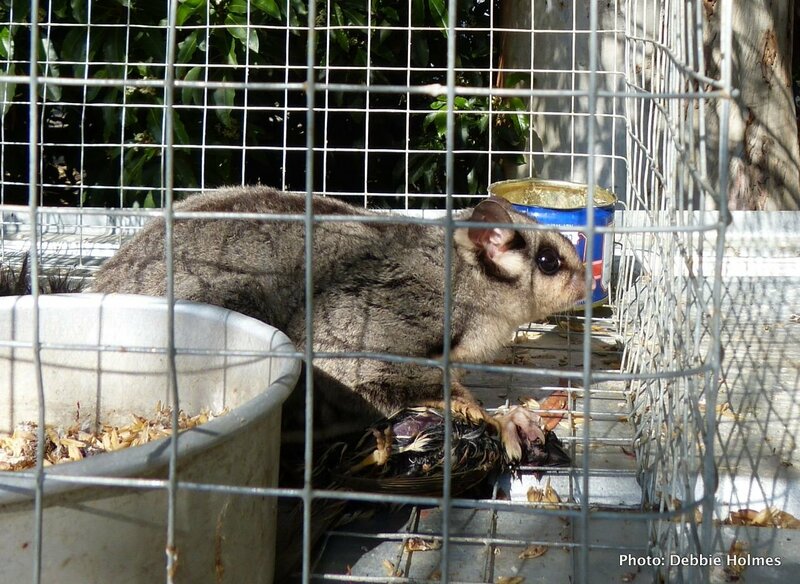 The cute, furry little fellow was discovered one morning by the trap owner, Debbie, tucking into some alfresco sparrow. Debbie knows the sparrow was in the cage the night before (she’d left it in there, hoping it would attract additional birds). But, by next morning, the glider had apparently killed the sparrow and just begun eating a hole through the poor little bird’s skull, dining on brains for breakfast. It’s known that Squirrel Gliders occasionally take eggs and nestlings from bird’s nests, as well as eating insects, nectar and gum, but now we can put sparrows on the list. It’s a remarkable observation. Interrupted at meal-time, but not too fussed. The Indian, or Common Myna (Acridotheres tristis) was introduced to Melbourne in the 1860’s and since then has become a major pest in many areas throughout south-eastern Australia. Since being introduced to Canberra in the 1960’s, by 2006 the Myna population had grown to 100,000+ (ref). The impact of these birds on native fauna has become a major ecological issue in cities and in rural areas. You can read lots more about Mynas and Myna-control on the Canberra Indian Myna Action Group and the Yarra Indian Myna Action Group websites. Next Next post: Caper white butterflies–harbingers of summer.